Boston Voyager: Today we’d like to introduce you to Olu Ibrahim. Kids in Tech founder Olu Ibrahim credits her parents for her insatiable appetite for learning and commitment to helping her community. Her love of technology was born when her father brought home a Gateway 2000 PC and told her and her sisters that it was “the future”. Throughout her career as an educator, Olu observed many children who lacked the necessary tools and opportunities to pursue computer science in their educations and careers. After learning about the potential for mid-sized cities to participate in the next wave of technological innovation, Olu founded Kids In Tech with the dream of spreading the curiosity and appreciation her parents taught her and the educate and inspire the next generation of tech leaders. Starting a nonprofit or a for-profit, or a hybrid entity is not an easy feat. I have found that you have to remind yourself no matter how passionate you are about you are working on, you have not to make sure that you are spending time with family and friends– having a self-care routine of some sort. Kids in Tech, Inc. – what should we know? What do you guys do best? What sets you apart from the competition? Ms. Ibrahim spent the first half of 2015 gathering support for Kids in Tech among her community, researching community need, raising funds, developing a program model, and writing the curriculum for Kids in Tech’s after-school STEM Education Program. 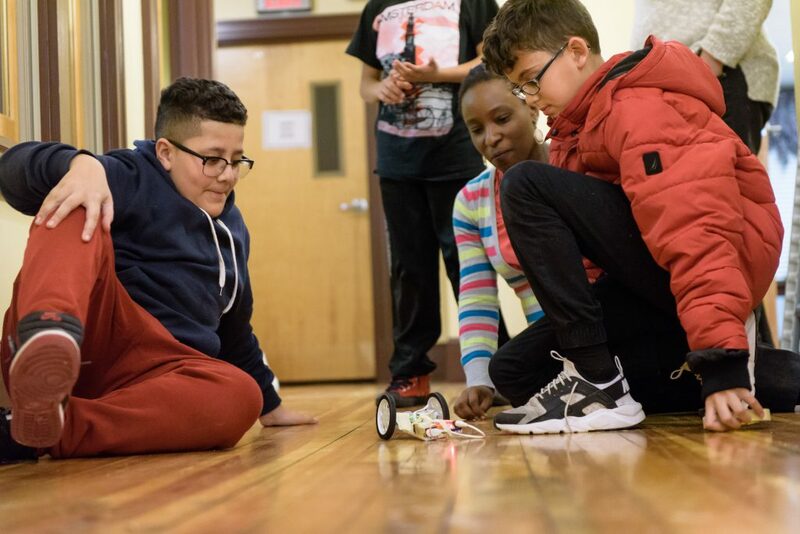 Kids in Tech became incorporated in July of 2016 and by the fall of 2016, Kids in Tech launched its first after-school program with Girls Inc of Greater Lowell’s after-school youth development program. In spring of 2017 Kids in Tech launched an additional after-school Tech Club with Coalition for a Better Acre. Since our launch, we have conducted 3 Tech Club programs for a total of 50 students. Our after-school program partners with schools and youth development organizations to provide technology education to children ages 8-14. We recruit qualified teacher and corporate professionals, perform interviews and background checks, and train them in our project-based computer technology curriculum. This pair is are then matched with staff liaisons with local schools or community organizations where they conduct semester-long courses. These courses are held once or twice a week and culminate in a final project presentation in which students showcase the skills they have learned. During the course, students go on field trips to local business and colleges to meet people pursuing or working in computer and technology jobs. Kids in Tech received its 501(c)(3) determination in May of 2017 and is now poised to expand its successful pilot program to more after-school settings throughout the Greater Lowell area and into neighboring cities. With help from our community, our partners, and from funders we will continue in expanding our programs so that Lowell, Massachusetts serves as a model for mid-sized cities looking to build a pipeline of the technology sector talent necessary to attract innovative businesses and economic growth. I evaluate success based on not only my work but the work of my team–volunteers, the board of directors and advisers to the organization. The team needs to achieve both our individual and our team goals as successful. Personally, success to me is adding value to our relationships, being of service to your community, your well-being, it is the self-satisfaction in knowing you made the effort to do the best of which you’re capable. I also really like this quote by Maya Angelou, “Success is liking yourself, liking what you do, and liking how you do it .” I also agree with Arianna Huffington when she stated success focuses on four pillars: well-being, wisdom, wonder, and giving.